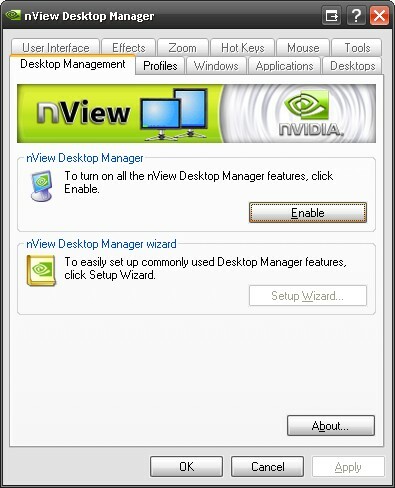 If you have a recent version of the nVidia drivers, but are unable to find the nView Desktop manager, try accessing it via the control panel first. This entry was posted in Software, Tech Tips and tagged desktop manager, nvidia, nview. Bookmark the permalink. the latest driver pack under windows 7 64bit does not automatically install nview, had to do the stupid hack of extracting the nview cab file and installing it that way… but noticed a few windows will not show the tools, and/or most of them don’t work. Do you also know, how I could autostart (autoenable) the nView Desktop Manager again, to have the extra nView windows buttons and menue for my multi monitor system automatically available after every start?